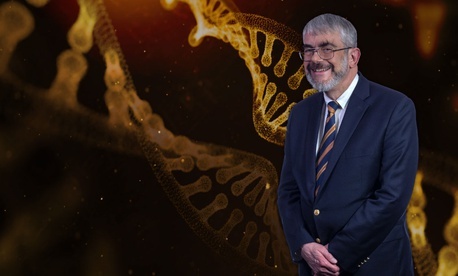 Dr. Daniel Kastner of the National Institutes of Health won the federal employee of the year award for uncovering the genetic causes of seven rare, debilitating illnesses. Braun Film and Video Inc. The 17th annual Service to America Medals (nicknamed the Sammies) will be awarded to eight standout federal employees on Tuesday night, providing some limelight to a pioneer disease geneticist, a team that foiled wire fraud schemes and designers of air traffic control systems for drones. The winners, along with the other finalists announced in May, will be honored at a banquet at the Andrew Mellon Auditorium in Washington that will also feature a special “fireside chat” between author Michael Lewis (whose new book “The Fifth Risk” analyzes President Trump’s unusual presidential transition) and Amazon.com founder Jeff Bezos. Bezos, creator of the Blue Origin outer-space effort and owner of The Washington Post, will receive the Sammie organizers’ first- ever Spirit of Service award, which will go to individuals outside of government who make a key contribution to public service. Emceed by PBS NewsHour Host Judy Woodruff, the gala for 600 guests will include Federal Trade Commission Chairman Joseph Simons, National Institutes of Health Director Francis Collins, Office of Management and Budget Deputy Director for Management Margaret Weichert, and Rep. Mark Meadows, R-N.C.
For the 2018 class, the evening’s top honor, the Federal Employee of the Year, will be presented to Dr. Daniel Kastner of the National Institutes of Health. Kastner uncovered the genetic causes of seven rare, debilitating illnesses he categorized as auto inflammatory diseases, alleviating suffering for thousands of patients in the United States and around the world. The Career Achievement Medal recipient is Dr. Marshalyn Yeargin-Allsopp of the Centers for Disease Control and Prevention. She pioneered ground-breaking research and surveillance systems that for the first time documented the prevalence of autism, intellectual disabilities, cerebral palsy, hearing loss, vision impairment and epilepsy among children. The Homeland Security and Law Enforcement Medal winners are Karen Dodge of the Chicago office of the Federal Trade Commission and Margaret (Molly) Moeser of the Justice Department in Washington. They led parallel nationwide criminal and civil investigations into con artists that resulted in Western Union, the world’s largest money transfer company, admitting to allowing criminals to use its service to collect scam-related payments. The company forfeited $586 million to reimburse victims. The National Security and International Affairs Medal goes to Andrew Herscowitz and the Power Africa Team of the U.S. Agency for International Development (based in Pretoria, South Africa). They brought together technical and legal experts, the private sector, financial institutions, 12 federal agencies, and governments from around the world to provide electricity to more than 50 million people in this region. The team’s 117 electrification projects have spurred economic development while generating hundreds of millions of dollars in opportunities for U.S. exporters. The Management Excellence Medal goes to Marcella (Marcy) Jacobs and the Digital Service Team of the Veterans Affairs Department (Washington, D.C.). They helped veterans access their benefits through a simplified login system and new ways to apply for health and education benefits and monitor disability claims and appeals. The Promising Innovations Medal winners are Parimal Kopardekar, and the UTM Team of NASA’s Ames Research Center (Moffett Field, Calif.). They worked across agencies and with private-sector partners to design the first-of-its-kind traffic management system for unmanned aerial vehicles, which may number 700,000 by 2020 delivering packages, monitoring traffic and helping with search and rescue. The Science and Environment Medal goes to Margaret (Peggy) Honein of the Centers for Disease Control and Prevention. She quickly assembled a team that collected and analyzed critical nationwide data on the mosquito-borne Zika virus in order to protect pregnant women and babies when it began spreading in 2015-16. Finally, in a special category, the fourth annual Service to America Medals People’s Choice award was presented in July to Alison Smith of the Naval Surface Warfare Center in Crane, Ind. She pioneered the use of nanoparticles to mark sensitive military equipment with a unique fingerprint to guard against counterfeit products and protect warfighters. The public voted for Smith out of all 27 Sammies finalists. Named in 2010 for entrepreneur Samuel J. Heyman, who founded the nonprofit partnership, the Sammies began in 2002 as a way to spotlight public-sector talent. More than 500 have since won the awards. Winners are chosen by a selection committee of leaders from government, business, foundations, academia, entertainment and the media.